ATM Cash replenishment and related activities. The SARA network is quite formidable and unparalleled. With a vault networks our team covering major towns daily. Our cash pick-up service has been tuned to service the requirements of retail chains and comes with highly customizable features and options. A large network ensures that any new customer/pick-up point can be built into our route map within 24 hours. This facet of our service is geared toward corporations which have a network in smaller towns and remote areas and perhaps lack access to immediate banking channels. Here we provide the fastest, most efficient and secure way to consolidate and streamline cash collections. We count among our valued clients leading insurance firms, hospital chains, educational institutions and logistics & shipping companies, who use our enterprise solutions. A compelling value addition to our service is our teller management services: SARA personnel trained in client MIS systems, take over and manage the complex task of handling cash, accounting and reconciling it for our clients. Solutions are customized to client needs and begins with identifying the appropriate number of tellers for specific cash payment or receipt loads, and then training them on the client’s MIS and accounting systems. 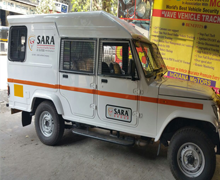 SARA also handles several high value cargoes through a specialized supply chain, which consists of secured transport and vaulting systems that can be customized to pick up and deliver jewelry, bullion, media or important documents. As part of our home banking services, we also take care of individual cash deliveries for all leading banks. Secured transport and vaulting is an integral component of our offerings. We provide bulk transits of currency for both inter-city and inter-branch through our secured fleet. Each transit involves comprehensive risk assessment and a detailed security drill. Our measures are pre-emptive, tactical and reactive, relying equally on specially trained personnel and technology. It reflects in our choice of team units, vehicles, route-mapping, tracking and reporting methodologies.